The Christmas Tree is finally up. 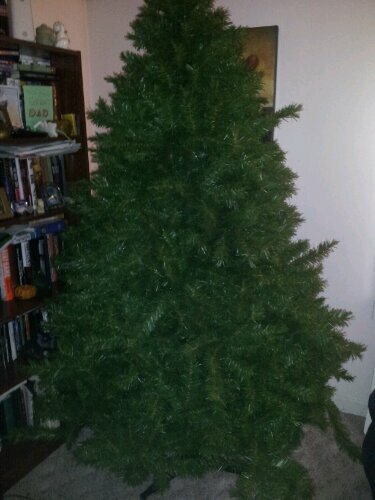 It’s bare- no lights or ornaments decorating it yet, but at least it’s up! Funny how much things change when you have a kid, especially a mobile one. Back before the Days of Mobile Nathan, we could haul the tree out, assemble it, light it, and decorate it on one fel swoop. It took a few hours but everything was accomplished in one day. Now? Now we do things in increments because there is a certain little.man running around who has a penchant for making things a tad difficult. But that’s ok; I wouldn’t have it any other way. So anyway, we assesmbled the tree after Nathan had gone to bed. That way he could be surprised when he woke up in the morning. And he sure was! When he ran into the living room the following morning, his entire face lit up the moment he saw the tree. He didn’t care that it was bare- it’s still a Christmas Tree, after all, and he was delighted to have it there waiting for him. And he can’t help himself. He has already started digging around in the branches, leaving telltale clues of his mischief. He’s going to love helping put the ornaments on! Let’s just keep our fingers crossed that he can refrain from removing them and secretly playing with them this year! So one day, Nathan was being pretty quiet as Paul and I relaxed together in the living room. Suddenly, Nathan burst into the living room, beaming from ear to ear, his happy little feet pounding on the floor, reverberating enthusiastically throughout the house. “Mommy! Daddy!” he hollered. “The egg! The egg, it hatched!” Paul and I exchanged wary glances as we knew some sort of mischief must have occurred. 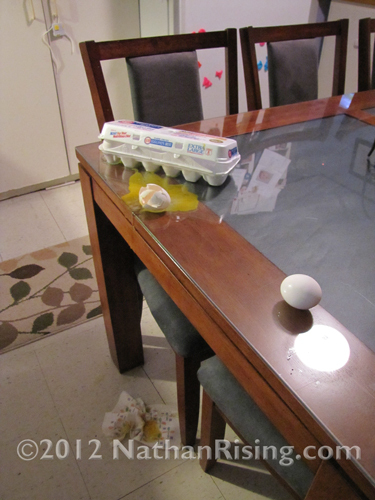 I strode into the kitchen to discover what Nathan was talking about. Sure enough, an egg had “hatched.” With Nathan’s help, of course. And see that napkin on the floor? Nathan had even tried to clean up his mess. Oh, my sweet little boy.